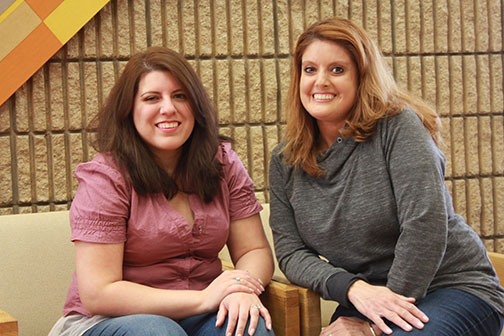 Known around Indiana University Northwest as the “Hamilton Twins,” Rosie and Krystina Hamilton of Dyer are not sisters, but actually a mother-daughter duo. The pair earned this moniker because of their parallel paths through IU Northwest. On May 11, both will walk across the Commencement stage to receive their bachelor’s degrees in general studies, and minors in sociology and anthropology. Rosie, 47, served several years in the U.S. Army, followed by a 19-year career. But in 2011, when her employer went through a reallocation, it gave her pause. Perhaps now was her time to see her dream through, she thought; perhaps this was her opportunity to go back to school and earn her college degree. As coincidence would have it, Krystina, now 24, was graduating from Lake Central High School, and like her mother, found herself at a crossroad. Recognizing they shared the same goals and dreams, the Hamiltons enrolled at IU Northwest, together. Over the last four years, Rosie and Krystina were a true team, studying, researching, debating and excelling together. Knowing the benefit of a built-in study buddy, the Hamiltons did everything the same. They enrolled in the same courses, with the same professors, at the same time. Semester-after-semester they kept each other motivated and accountable, as they counted down the credit hours to completion. At times, it seems their roles had reversed, with Krystina tutoring her mom through math and offering words of encouragement, while Rosie trudged along, threatening to give up. It is clear the pair mastered the nuances of balancing their roles along the way. Perhaps this is a special category of skills that will continue to serve them well. Now that they are college graduates, they are both seeking jobs, in the same fields. And, it doesn’t bother them that they are applying for the same jobs. In fact, working together, they both agreed, would be a welcome and comfortable arrangement.